One of Brunswick's shopfront cafes (cf Ray's, Small Block, La Paloma), A Minor Place offers guests milk crates and fold-out tables outside. Inside, an easterly window welcomes plenty of sunlight over the wooden communal tables as well as a few smaller seating options. It's a minimalist fitout that is netting reward: on a Wednesday lunchtime at least 20 people are seated amongst the tables. Isabelle Lucas, former Neighbours star, notes it as one of her favourite spots in an interview with the age(melbourne) magazine. Their menu features plenty of organic produce and an imaginative take on breakfast. My menu highlight is the french toast: casalinga bread dipped in free-range eggs, served with stewed rhubarb, quality maple syrup and moreish pistachio ricotta. Their coffee is carefully made and strong. 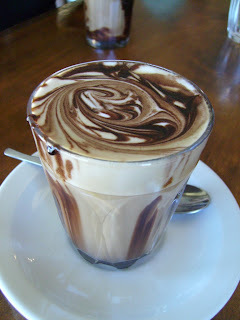 This mocha looked too well-decorated to drink, so I photographed it to allow it to be preserved on the web, then vigorously stirred and took my time enjoying the blended tastes of bitter coffee and rich, sweet chocolate.